A Libyan rebel fires in air as others wave Libyan pre-Gadhafi flags as they ride a vehicle at twilight in Benghazi, Libya. The Obama administration has sent teams of CIA operatives into Libya in a rush to gather intelligence on the identities and capabilities of rebel forces opposed to Libyan leader Moammar Gaddafi, and assessing “all types of assistance” for the rebels according to U.S. officials. While the White House debates whether to arm rebels battling Moammar Gadhafi’s troops, U.S. officials have acknowledged that the CIA has sent small teams of operatives into Libya and helped rescue a crew member of a U.S. fighter jet that crashed. Battlefield setbacks are hardening the U.S. view that the poorly equipped opposition probably is incapable of prevailing without decisive Western intervention, a senior U.S. intelligence official told The Associated Press. The CIA’s precise role in Libya is not clear. Intelligence experts said the CIA would have sent officials to make contact with the opposition and assess the strength and needs of the rebel forces in the event President Barack Obama decided to arm them. An American official and a former U.S. intelligence officer, who spoke on condition of anonymity because of the sensitivity of the information, told the AP about the CIA’s involvement in Libya after the agency was forced to close its station in Tripoli, the capital. They said CIA helped safely recover the F-15E Strike Eagle’s weapons specialist, who was first picked up by rebels after the crash March 21. The pilot was rescued by Marines. The former intelligence officer said some CIA officers had been staging from the agency’s station in Dubai, in the United Arab Emirates. The New York Times first reported the CIA had sent in groups of operatives and British operatives were directing airstrikes. Obama said in a national address Monday night that U.S. troops would not be used on the ground in Libya. The statement allowed for wiggle room as the president explores options in case he decides to use covert action to ship arms to the rebels and train them. In that event, the CIA would take the lead, as it has done in the past such as in Afghanistan after the Sept. 11 attacks and the run-up to the Iraq invasion in 2003. In those covert action programs, CIA officers along with special operation forces were sent in, providing arms to opposition forces to help fight the Taliban in Afghanistan and Saddam Hussein in Iraq. The CIA’s efforts represent a belated attempt to acquire basic information about rebel forces that had barely surfaced on the radar of U.S. spy agencies before the uprisings in North Africa. Resistance: Hundreds of resurgent Libyan rebels gather near Nofilia, 62 miles from Sirte yesterday as Gaddafi forces pushed them back further east. Among the CIA’s tasks is to assess whether rebel leaders could be reliable partners if the administration opts to begin funneling in money or arms. Obama took a key step in that direction by issuing a secret authorization known as a presidential “finding,” designed to pave the way for the flow of money or weapons. News of the finding, signed several weeks ago, was first reported Wednesday by Reuters. Under law, the CIA requires special permission from the president to carry out activities designed to influence foreign events. A finding establishes a framework of legal authorities for specific covert activities, and in some cases for future actions that can be taken only after specific permission is given. Such operations are fraught with risks. The CIA’s history is replete with efforts that backfired against U.S. interests in unexpected ways. In perhaps the most fateful example, the CIA’s backing of Islamic fighters in Afghanistan succeeded in driving out the Soviets in the 1980s, but it also presaged the emergence of militant groups, including al-Qaeda, that the United States is now struggling to contain. Giving the CIA an expanded role in Libya would enable the administration to bridge the gap between the restrictions on coalition airstrikes and Obama’s stated goal of bringing Gaddafi’s four-decade rule to an end. The CIA’s Special Activities Division includes paramilitary operatives who could help guide rebel operations as well as allied airstrikes. Even amid an escalating campaign of coalition airstrikes, opposition forces have repeatedly mounted ill-advised assaults on Gaddafi positions and have been forced to retreat from territory they had gained. Seems like more help is on the way for the rebels. The recent events in Japan will have an impact on South Africa’s nuclear power plant proposals. The devastating events in Japan over the past week have dominated the news headlines all over the world. First came Japan’s most powerful earthquake since records began, then followed the tsunami triggered by the 8.9 magnitude tremor that wiped out whole towns on the north-east coast. However the concerns about radioactivity after reactors at a nuclear power plant exploded is the latest worry – and could even prompt a U-turn on proposals to build new plants to increase nuclear supply in South Africa. South Africa currently operate the only nuclear plant in the continent near Cape Town and wants to construct six new 1,600 megawatt plants to increase the percentage of nuclear energy in its supply to 14 percent by 2030. “I believe that as a country we need to be alive to what is happening in that part of the world,” he added. The government is currently debating a new energy resource plan to outline South Africa’s energy mix in the next 20 years and Peters was speaking at the Africa Utilities Week in Cape Town. The increased nuclear output is being cited as a possible solution to the kind of power shortages South Africa experienced in 2008, causing chaos and a loss of billions to industries when demand outweighed supply. But the Japan crisis has led to safety fears over nuclear activity and Chief Executive of the nation’s energy supplier Eskom, Brian Dames, admitted that there are lessons to be learnt from the tragedy. “We are looking at how to draw lessons out of what has happened in Japan in terms of design and safety systems,” said Dames, adding that nuclear power was still a crucial element in energy supply. “Nuclear, as an energy option must play a role in terms of meeting not only South Africa’s energy needs but also global energy needs,” said Dames. This was inevitable given the seriousness and uniqueness of the earthquake-tsunami damage in Japan. Can’t fault South African officials for taking precaution. Is Ghana on the verge of history with possible win against England? Ghana aims to be the first African team to beat England as it gets ready to play a friendly against England. Ghana travel to Wembley on Tuesday night aiming to be the first African side to beat England – and they could have a great chance of making history as the hosts are likely to field a second-string team. It will be the first time the ‘Black Stars’ line up against the English national side and England manager Fabio Capello has warned he could make 11 changes from the team that beat Wales 2-0 in a European Championship qualifier on Saturday. However, Ghana players will have had one less day to recover having beaten the Congo 3-0 in an African Cup of Nations qualifier in Brazzaville yesterday. More than 20,000 tickets have been snapped up by Ghana fans cheering on their heroes to what could be an historic victory against the former “colonial masters”. A number of Ghana’s stars are used to the English conditions, earning their living in the Premier League. Trio Asamoah Gyan, Sulley Muntari and captain John Mensah play for Sunderland, while John Paintsil plays for Fulham and goalkeeper Richard Kingson for Blackpool. “Statistically no African side has ever beaten England so we will go there to try our luck,” Gyan said. “I have never played at Wembley so it is like a dream come true. This is a huge game for us Ghanaians. “There will be massive support for us. I have had so many calls from people asking for tickets – I don’t know how to get them though. England have been our colonial masters so everyone in Ghana knows about them. If we are not playing everyone at home always supports the English team. The friendly is a sell-out, although star players Wayne Rooney, captain John Terry, Ashley Cole, Frank Lampard and Michael Dawson have already returned to club duty and will not feature in the match. Earlier this month, we looked at the continent’s biggest football drug scandals after Ivory Coast defender Kolo Toure tested positive for a banned substance. The rising number of African stars playing in Europe was also a major factor in African football netting $140 million in TV rights recently. With England and South Africa both crashing out of the ICC Cricket World Cup over the weekend, why not take a look at the growing trend of South African-born cricketers playing for England. I hope that history is made on the day both sides play. I’m sure this will be a good game to watch. It is always exciting to watch Ghana’s black stars, especially in person. The fans that will be able to attend the game will enjoy every minute of the experience. Here is video highlight of Ghana’s black stars from last years World Cup. Pepsi is set to invest in a new manufacturing plant in Kenya. PepsiCo Inc.’s Kenyan unit will build a manufacturing plant in the capital, Nairobi, at a cost of 2.4 billion shillings ($28.4 million), Business Daily reported. Construction of the facility is expected to begin by April 15, the Nairobi-based newspaper said, citing Butch Moldenhauer, general manager of SBC Kenya Ltd. PepsiCo acquired SBC in 2009, it said. Joe Jacuzzi, a PepsiCo spokesman, didn’t immediately respond to a voicemail requesting comment when contacted outside regular business hours. Here is a Pepsi commercial for African markets. A French Rafale fighter plane taking off from a military base in Saint-Dizier, France, March 19. The jets head for Libya to enforce a no-fly zone and protect civilians and embattled rebel troops. Eyewitnesses report that fighter jets had already entered Libyan airspace while a special summit on the topic was still in session in Paris. French presdident Sarkozy announced that attacks on the pro-Gaddafi forces have been launched after World leaders gathered in Paris on Saturday to discuss the course of action regarding Libya after the UN Security Council passed resolution 1973 that demands the immediate establishment of a cease-fire and a complete end to violence and all attacks against civilians. France has taken a robust and assertive role in the action against Libya. The military action against Libya given approval by U.N. Security Council resolution 1973 began, allowed the coalition to what whatever possible in defense of the civilians in Libya. French President Sarkozy said, “If we intervene on the side of the Arab nations it is because of a universal conscience that cannot tolerate such crimes.” The one question that many raised was why the French government took the lead? This is mainly due to a few factors with French domestic politics and France’s history, interests in Africa. First on the domestic front. With his popularity at a record low and facing a presidential election next year, Nicolas Sarkozy is in desperate need of a boost to his political stature both at home and abroad. With polls showing that Sarkozy is the least popular president since the founding of the Fifth Republic in 1958, he is betting that French voters will appreciate his efforts in Libya to place France at the center of the world stage and reinforce what Charles de Gaulle once famously called “a certain idea of France” as a nation of exceptional destiny. In any case, Sarkozy’s main rival is not Gaddafi, but rather Marine Le Pen, the charismatic new leader of the far-right National Front party in France. A new opinion poll published by the Le Parisien newspaper on March 8 has Le Pen, who took over from her father, Jean-Marie Le Pen, in January, winning the first round of next year’s presidential election. Le Pen, who appeals to middle class voters, is riding high on voter dissatisfaction over the failure of the mainstream parties to address the problem of Muslim immigration. Since taking her post three months ago, Le Pen has single-handedly catapulted the twin issues of Muslim immigration and French national identity to the top of the French political agenda, and in recent weeks, Le Pen has been a permanent fixture on French prime-time television to discuss the threat to France of a wave of immigrants from Libya. The crisis in Libya provided that unique opportunity to get rid of the image of a sinking reactive presidency. On taking action in Libya, he said that France had “decided to assume its role before history” in stopping Gaddafi’s “killing spree” against people whose only crime was to seek to “liberate themselves from servitude”. “Libyans wanting nothing else but the right to decide their own future find themselves in danger of death. We have a duty to respond to their anguished call,” he said. When he summoned world leaders to an emergency war council at the Elysée Palace to agree on military action against Muammar Gaddafi last week, his 20 guests had barely come to an agreement when Sarkozy announced French planes were in the air – and had been for some hours – preparing to strike Libyan targets. President Sarkozy taking charge was also in sharp contrast to his predecessor Jacques Chirac who was in opposition to the UN resolution on military action in Iraq, and joining along with the United States in going to war, were as Sarkozy lead in the effort to military action against Libya through the United Nations. Prior to sending in the French air force to enforce the no-fly-zone, France became the first and only nation to recognize the rebels as the “legitimate representatives” of the Libyan people. Critics and cynics rightly pointed out that Sarkozy was desperate to atone for France’s incompetent handling of the uprisings in Tunisia and Egypt. This was in effort to erase in peoples minds the image of when he welcomed Gaddafi with open arms three years ago, with a red carpet and bringing half the capital to a standstill and allowing the Libyan leader to pitch his bedouin tent near the Elysée. Across North and West Africa, France has long coveted its ties with its former colonies in Africa as its influence waned elsewhere, clinging to them as a sign of prestige and as part of the Gaullist doctrine that dominated French foreign policy for the latter half of the 20th century. At the beginning of the 21st century, France is finding that its position as patron to Third World countries is becoming untenable due to the increasingly unacceptable political, economic and security-related situations in many of these countries. It is becoming clear day by day that France will need Africa more than Africa will need France in the future. France’s consistent offers of military and economic support to the embattled leaders of these countries may now be withdrawn as Sarkozy tightens France’s sphere of influence. He is now focusing on the area around the Mediterranean where France’s core interests lie, including the former colonies of Lebanon and Algeria, where much of France’s non-European population hails from and where France’s colonial ties run deepest. Gradually over the years, Paris has been reducing its presence in Africa in the political, military and humanitarian spheres. Defence contracts and their secret clauses have been progressively renegotiated. The African continent is also no longer dependent on French funding, once a main source of influence. It now receives significant sums from the European Union, the World Bank and the International Monetary Fund, while China has become Africa’s biggest trading partner. For all of France’s recent attempts to disengage itself from its African past, the roots of its relationships still run deep. Franceafrique is changing – but that’s down to emerging domestic middle-classes and civil society demanding increasing openness from their leaders, certainly not because of France. Video report sheds more light on French influence in Africa and what Africans think. The French military prepares for and launches their first Libyan operation in which an an AWACS reconnaissance plane and four attack aircraft took off for Libya. Threatened by Le Pen’s rising popularity, and in urgent need of a political boost, Sarkozy is now using the Libya intervention both to play the role of the respected statesman on the international stage and to address French concerns over mass immigration from North Africa. Libyan armed forces prior to current military conflict. 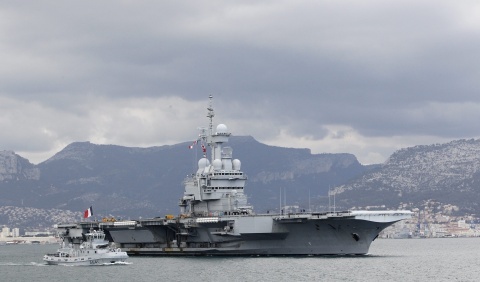 France's Charles De Gaulle aircraft carrier leaves the port Toulon, France 20 March 2011, for Libya. France on Sunday sent an aircraft carrier towards Libya as coalition forces continue their operations across the north African country. The French Navy’s flagship Charles de Gaulle vessel set off from the southern naval port of Toulon just after 1pm local time. There were 20 warplanes, a number of helicopters and two E-2 Hawkeye surveillance aircraft. It was accompanied by an attack submarine, three frigates and a refuelling ship. The coalition is primarily made up of armed forces from Britain, France and the United States. Their strikes against Colonel Muammar Gaddafi’s regime follow a UN Security Council Resolution authorizing the use of force.